Let me completely honest, for over a year or so I have been wanting to automate my Instagram account. Heck, I wanted to automate all my social media so I could free up some time. A while ago, I shared with my clients a list of platforms they could use for this. Honestly, I was not a fan of several of the platforms. Then Planoly* came to my attention again. Planoly happens to be something I am madly in love with for my businesses. Seriously, I am constantly on there and I am about to give you a complete breakdown on automation your Instagram account utilizing their platform.Late July, my friend Jessica of DSR Apparel were talking about it and I gave her a quick run down and I thought more business owners need a breakdown of this visual platform. Here is complete breakdown and then I am show you how I personally use it not only for Imperfect Concepts, but for Business Bestie too. You will see your current timeline. 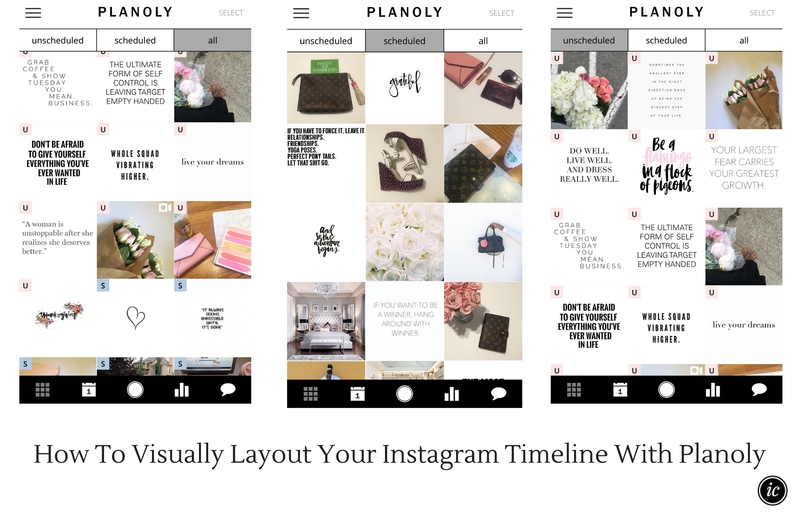 Now for how Planoly* works from the main page once you’re looking at your timeline. Every Sunday, for maybe 30 minutes while sitting on the couch watching HGTV or Netflix I schedule my post for week. Sometimes, I am focused on scheduling for the month. For example, all the content for Business Bestie is schedule for this month. I stick to a layout theme that helps me do this. You can read how to create a visual timeline to help you. After a month, of automating my post for both platforms I took notice of information that they provide in the below image. First, on both Instagram accounts I post once per day. Imperfect Concepts I try to post around 9 am CST. Then for Business Bestie I post in the evenings. Before I was posting them within minutes of each other. However, my audience is the same for both companies and sometimes people confuse the two. So, instead I implemented morning for one company and evening for other company. One of the video contents, I am making for Kick Start Your eCommerce is how to create visual imagery for your audience. I don’t want just pretty flat lay for one platform its for all platforms that my brand is. However, in this instance for Instagram I stick to a color theme and what my audience likes seeing. The middle button pulls up your camera and more you can see from the image below. Then you select from where you want to pull the image. Click all the images you want to upload. They will all appear in the “unschedule” section of the timeline. You have three sections for your timeline dashboard. Unschedule – Schedule – All as you can see from the image below. Schedule the content how you see fit for your timeline to look. When its time to publish your content Planoly* will send you a notification letting you know its time to post. One thing I REALLY love is that I am able to do this on my iPhone or my Macbook Air or iMac. Life made simple. In addition to that, your able to see the comments on your post, calendar view of what days and times you post and finally you’re able to analyzing your pages too.